Teufel Impaq 40 review | What Hi-Fi? We generally shop around to find the most real-world prices to quote at the top of our reviews, but with Teufel that's not necessary: the German manufacturer's products are available only from its own website. With a lead-time of 5-7 days for deliveries to the UK (which adds £19.80 to the Impaq 40's basic £279 pricetag) and an eight-week returns policy, the shopping experience is relatively quick and fuss-free, and the middleman-free system means Teufel can offer a lot for relatively little cash. With the Impaq 40 ‘a lot' refers to the size of the components rather than the features. This system offers just CD, USB and FM/AM playback – no iPod dock, no DAB tuner, no hard disk. What you do get is a chunky, averagely constructed main unit flanked by big, sturdy standmount speakers. And if that's starting to sound like a ‘proper' hi-fi, you're on the right track. 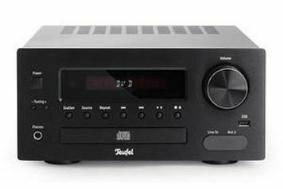 Play Mumford and Sons' The Cave, and the Teufel quickly establishes itself as one of the best-sounding units in this sector. The opening acoustic guitar is tight and detailed, and is quickly followed by clear, nuanced vocals. Then the piano and bass join the mix, with the former benefiting from a twinkle to the treble and the latter enjoying the depth and texture of the system's low-end. As the track becomes more upbeat and crowded, the Impaq 40 attacks it with vigour and precision, ensuring that you get all the thrills without any disorganised spills. A switch to The Bridge of Khazad Dum from The Fellowship of the Ring soundtrack proves that while reasonable separates will offer greater dynamic exuberance, the all-in-one Teufel is supple enough to convey the drama and foreboding of the piece's peaks and troughs. At this price, there's little to complain about with sound, but the sacrifices made to achieve this sonic success are too great for five stars. The lack of an iPod dock is forgivable; the missing DAB less so. And the lack of track information on the display can turn finding an individual track on a USB device into something of a needle-in-a-haystack affair. Bear in mind that its speakers won't perform at their best on a shelf, even if they fit on it, and it's easy to see that the Impaq 40 is stretching the notion of the do-it-all micro just a little too far.